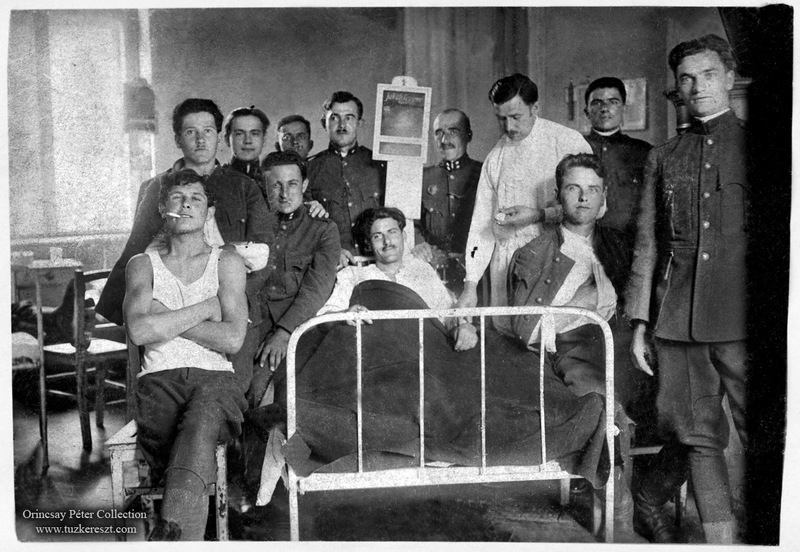 A great photograph of soldiers visiting their friends at a Hungarian military hospital. Looking at the uniforms and type of photograph, the photo might have been taken around the early 1930-th. 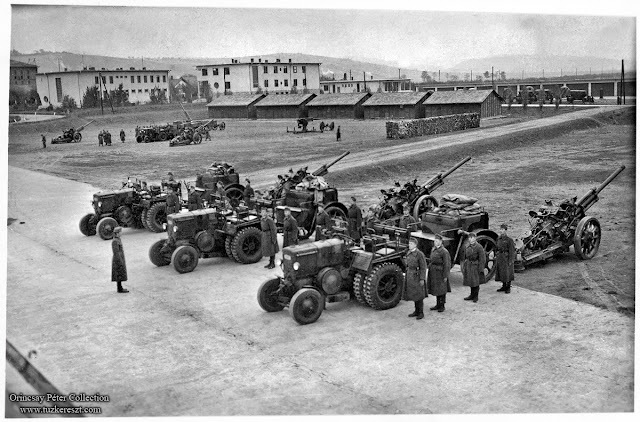 Obviously a staged group picture, it gives a great glimpse of the humour and style of the military life.
" 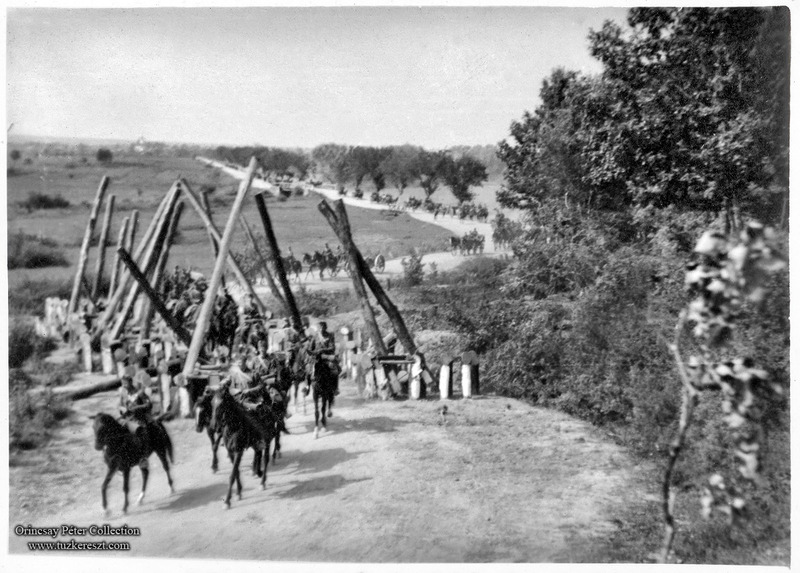 Bikes across the Border "
Hungarian bicycle-infantry crosses the Hungary - Romania border into Transylvania, during the 1940 Return of Transylvania (Erdély) campaign. 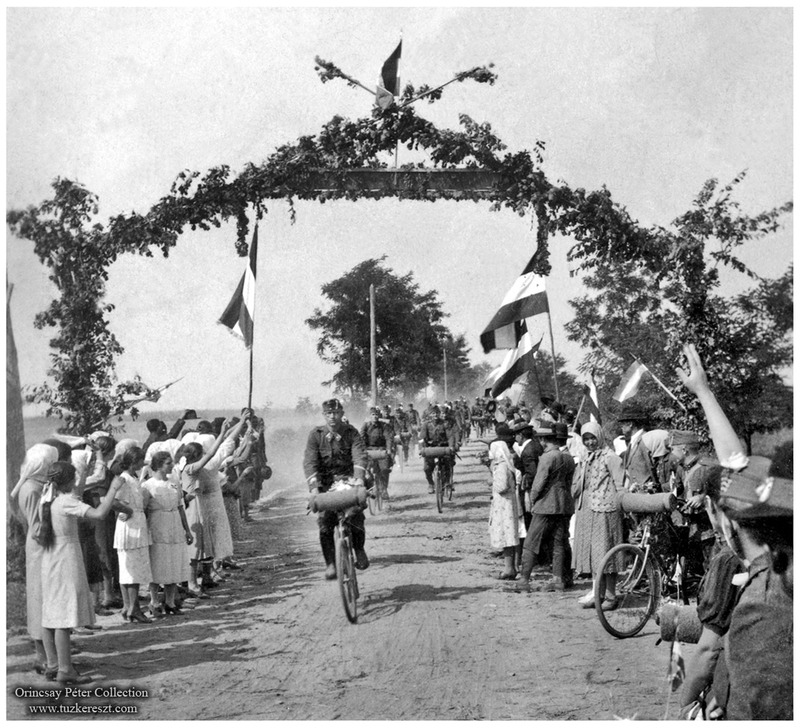 The Hungarian population across the border cheers as the bicycle-infantry passes. 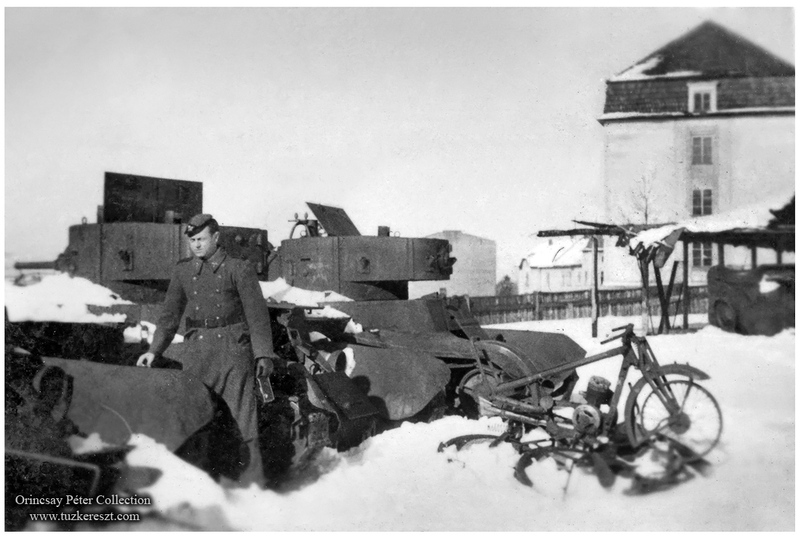 Hungarian Air Force private takes some time to inspect captured Soviet T-26 light tanks. The photograph is from a 1941 Air Force soldiers photo-album. 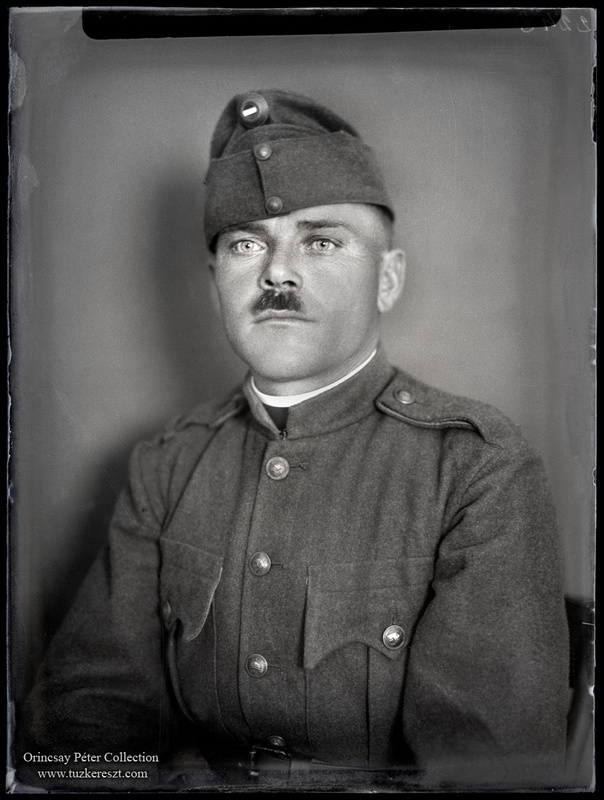 Portrait studio-photograph from an original glass-negative. 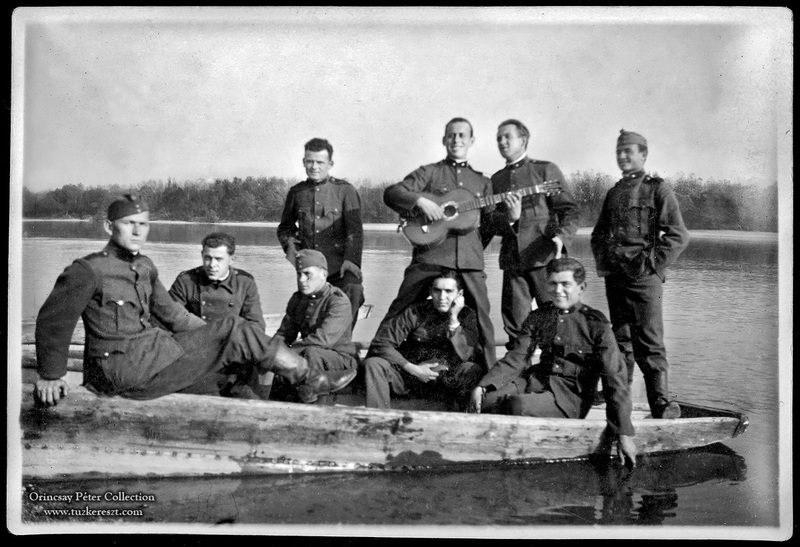 The razor-shap image quality is really fun to work with, digitalizing historical images. The negative has not lost any of it's original finish and could easily preserve the photograph for many years on. 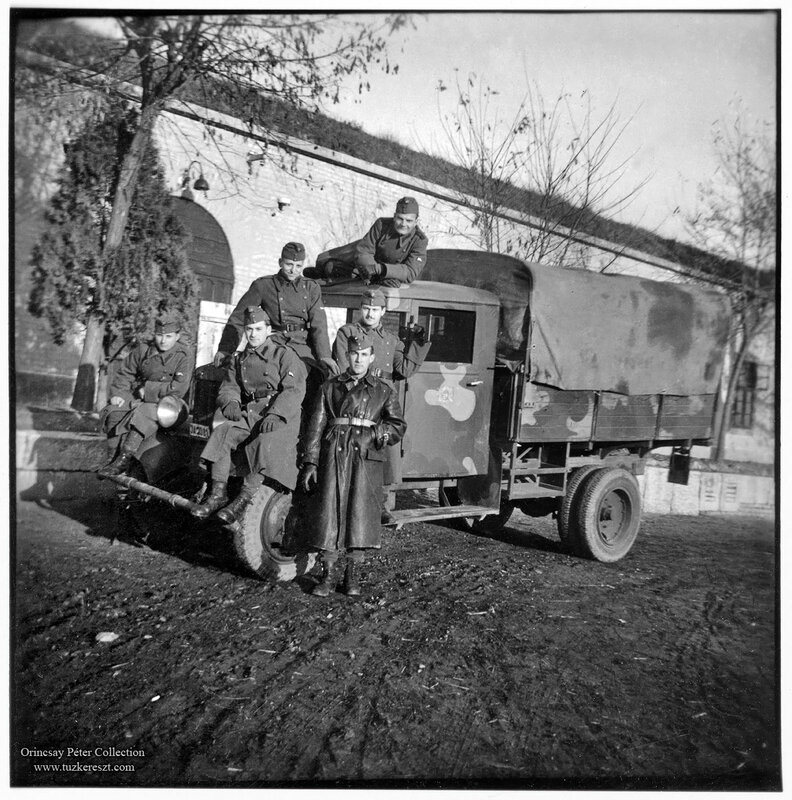 Using digital scanning technology every part of the gray-scale can me enhanced for the best result, even better then originally intended working with darkroom equipment for paper-prints.
" 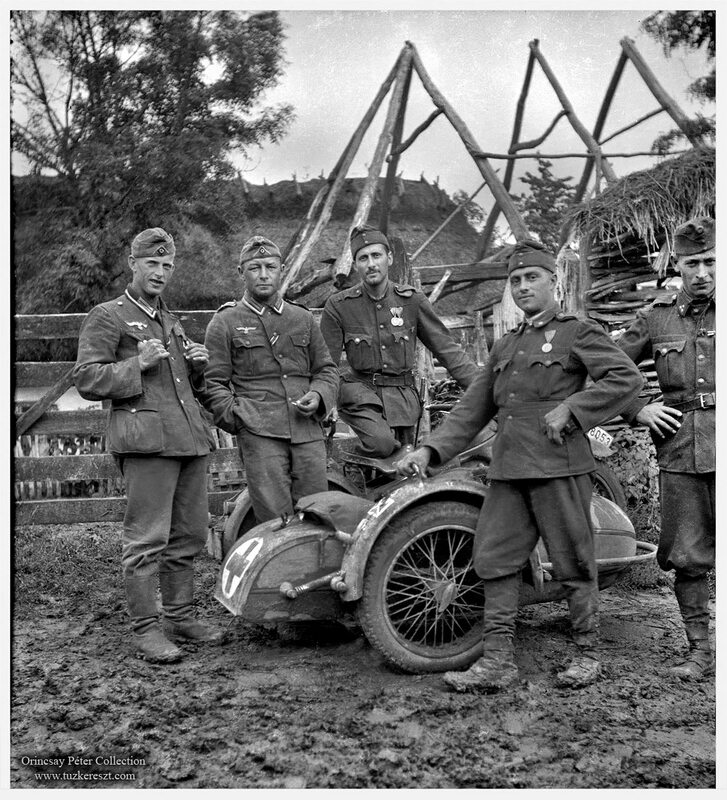 Somewhere in Russia "
German and Hungarian soldiers gathered around a Red-Cross motorcycle for a quick photograph. 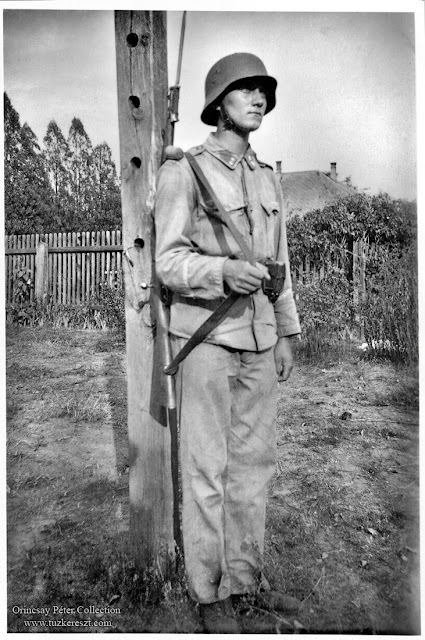 The primitive houses and mud filled roads, is starting to make the fighting soldier's everyday life harder for every day. 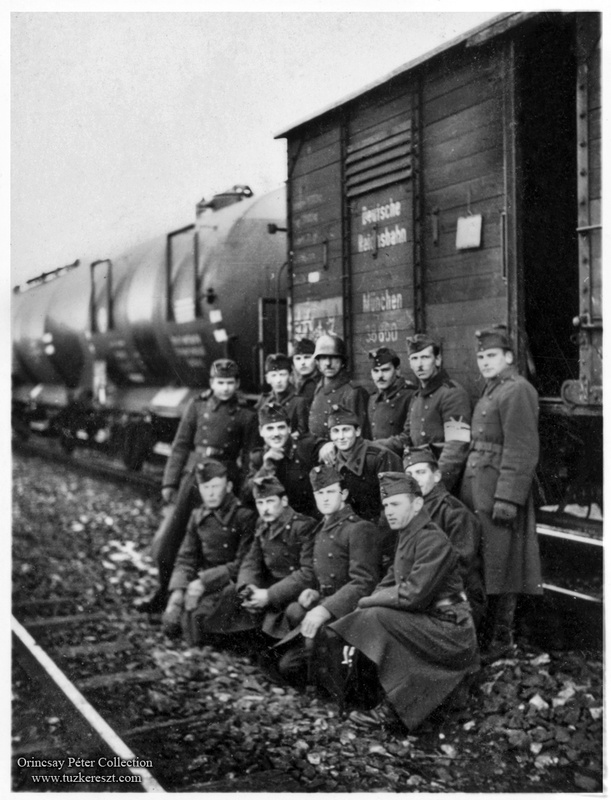 Heavy rain and freezing temperatures eventually turned the tide for the Germans and their Hungarian allies in the war when the supply lines broke down, due to the circumstances mentioned as well as the wast distances on the Russian front. 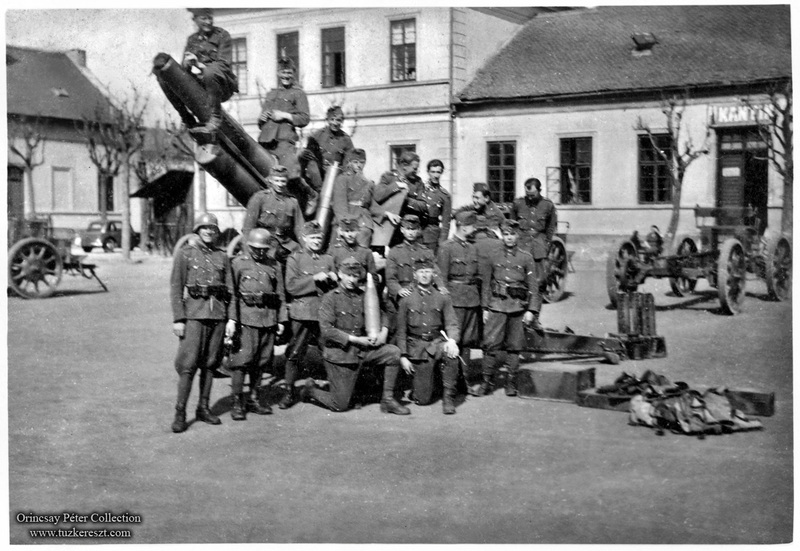 These are some of the photographs from the photo-heritage of artillery sergeant Lajos Gróf, taken between 1937-1941. The photographs gives a small glimpse of the everyday life, as well as the moments with friends and fellow Honvéd artillery soldiers. 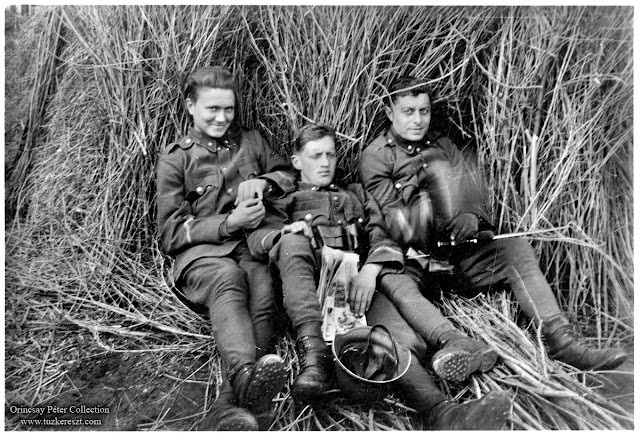 The happy life during the summer-exercises. The Hungarian Artillery passes the border to Romania (Transylvania) during the 1940 return of Transylvania campaign. Among friends by Artillery garden decor. 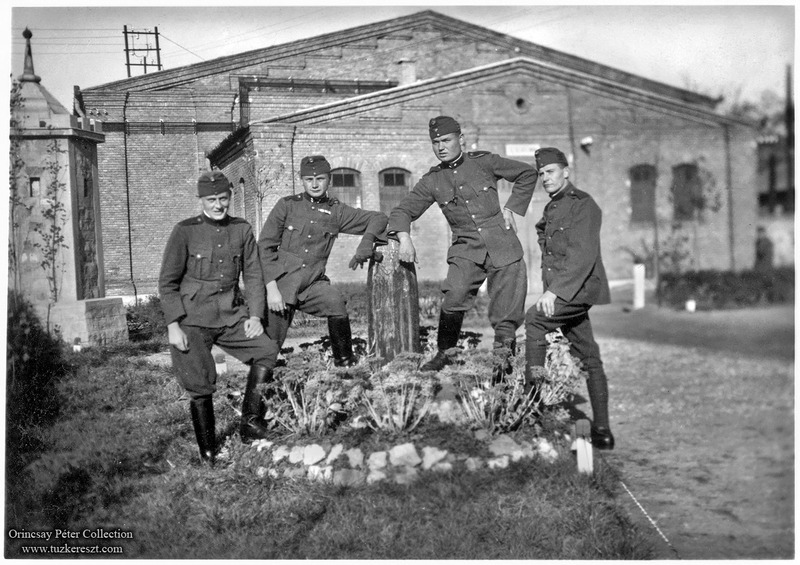 Posing for a group photograph in the regimental yard. Lajos Gróf in 1941, in a trench field equipped. 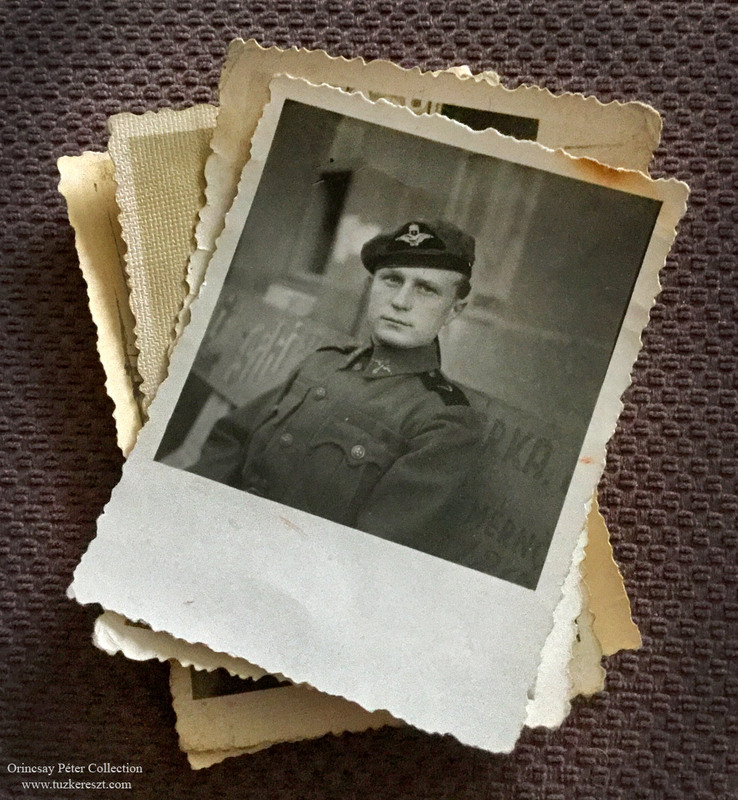 I often get the question what kind of photographs I use for this blog. Do I use the best possible quality photos, what size images I use, how do I acquire the right contrast and do I fix the photographs by manipulation. The photographs I use is normally the ones that is overlooked, but still contains very interesting details, and have potential if scanned and worked on. They might not be very expensive or sought after, but still a part of history. I scan the photographs in very high resolution and digitally remove damages and dust so the photograph get's it's original quality back, and then I work on the contrasts for the best finish. 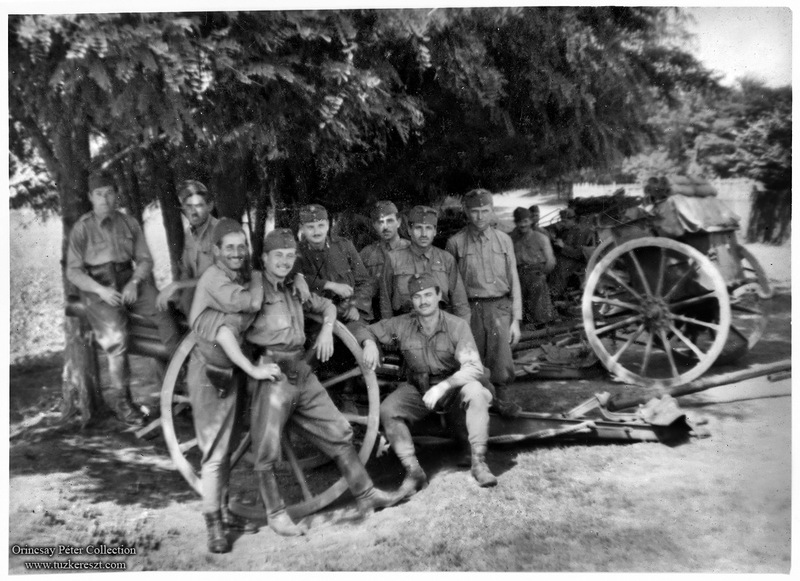 Sometimes this work (usually done in the darkroom by the paper developing) was never properly made, and left the original photo with poor contrast. 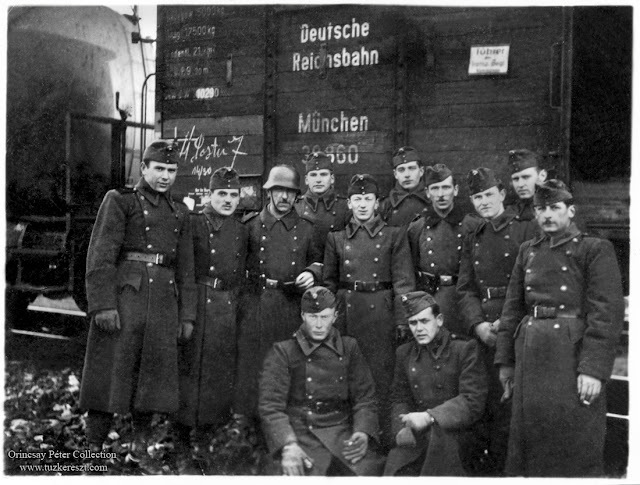 This is easily fixed in Photoshop and brings out an image never seen before.
" 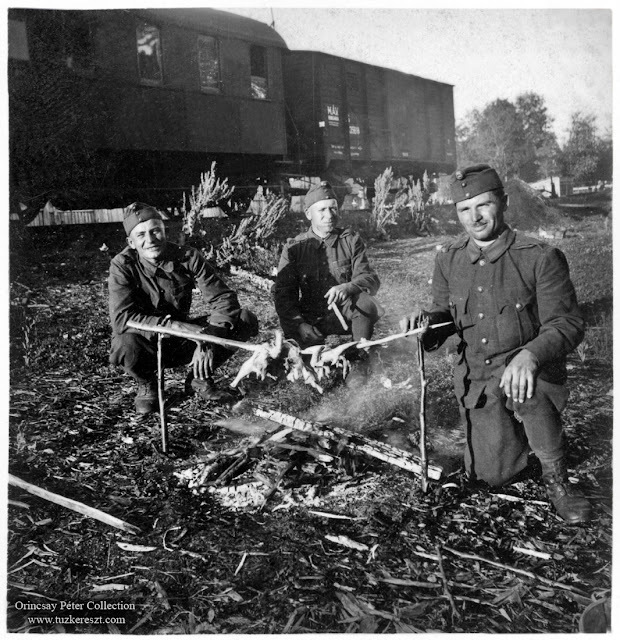 Preparing the meal "
Hungarian soldiers prepares some grilled meat as they recently arrived somewhere in Russia. 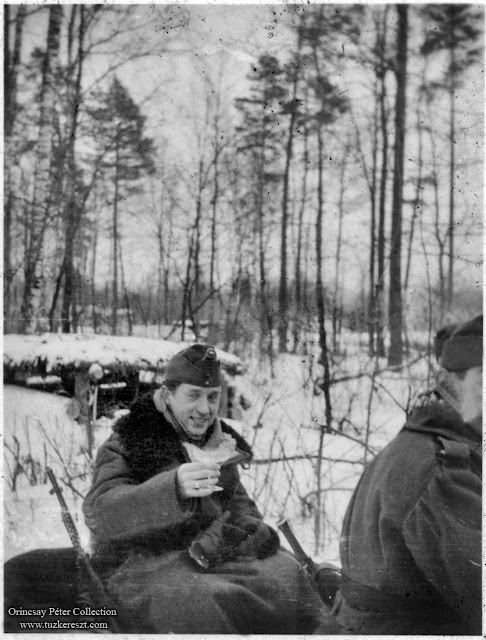 Sticks and a fireplace is all that is needed for this improvised cooking. Hungarian Soldiers pose for some last photographs before the departure to the front.
" Ready for Departure! " 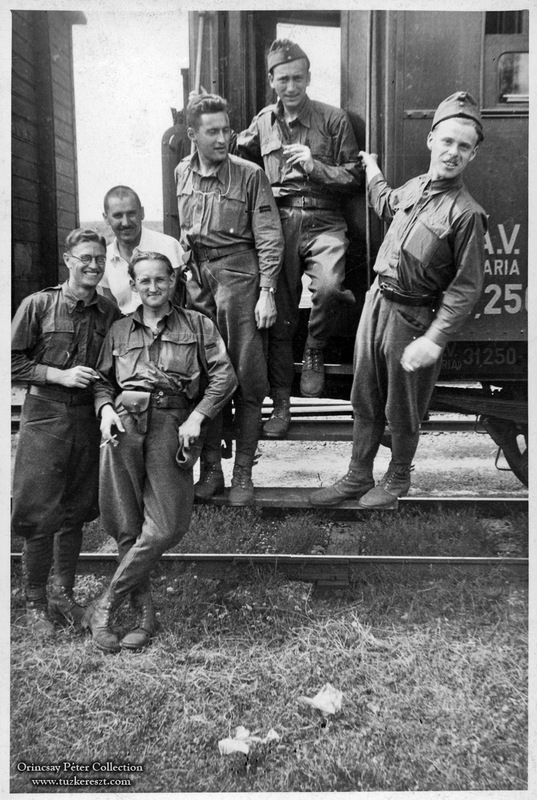 A last photograph before the soldiers leave, sitting in the back on the transport lorry. 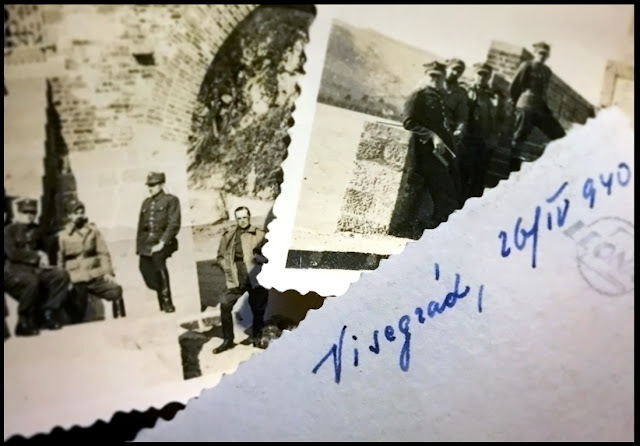 No notice or text where ever made on the back of the printed copy, so the place and destination, place or names of the Hungarian soldiers will most likely remain in the secret vault of history. The photo itself is a great snapshot and a detailed documentation of everyday military life.
" 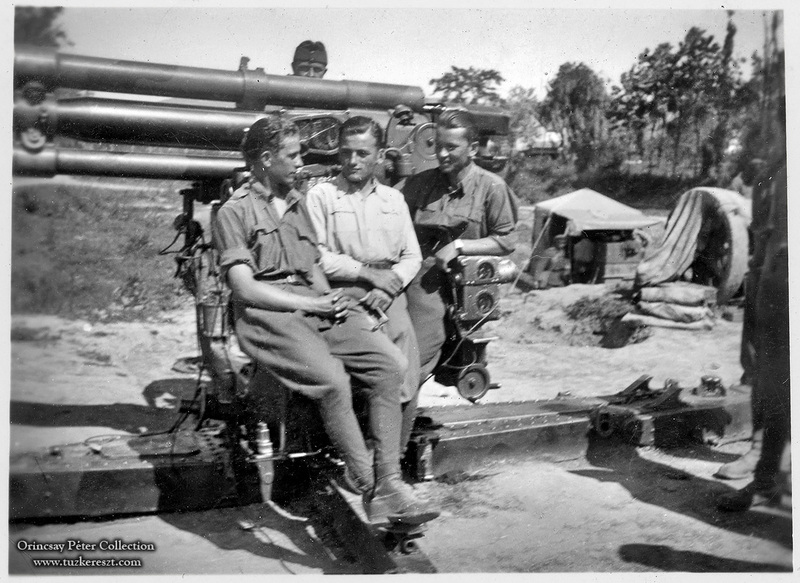 Three on a Gun "
Hungarian soldiers pose for a photograph on a anti-aircraft gun. 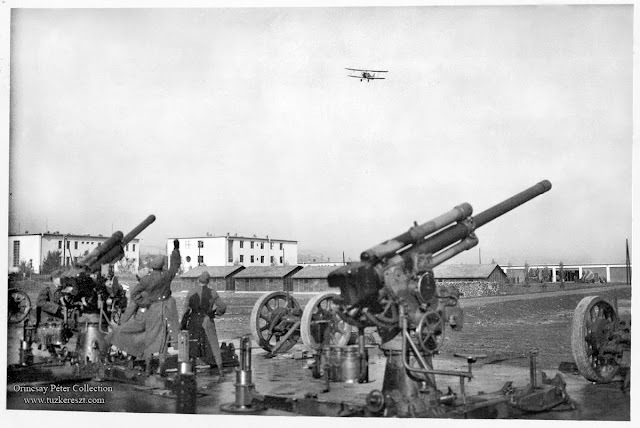 This heavy ground mounted air-craft gun could be used both for air-defence as well as to destroy enemy tanks depending on use.
" 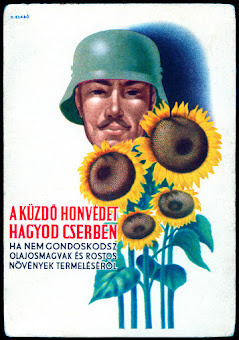 Őrmester Úr ! " 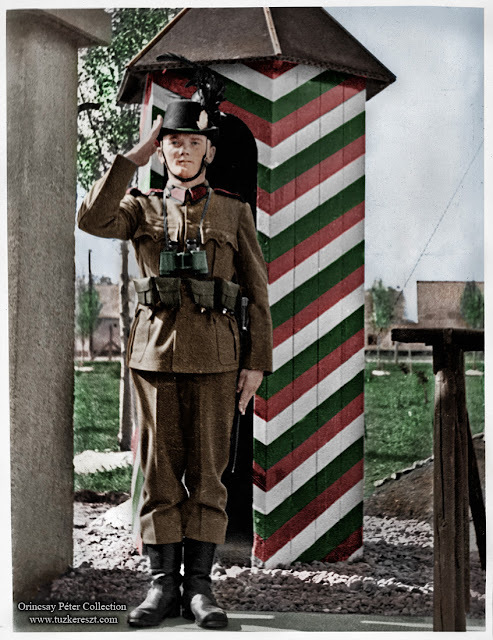 - Sergeant Sir! 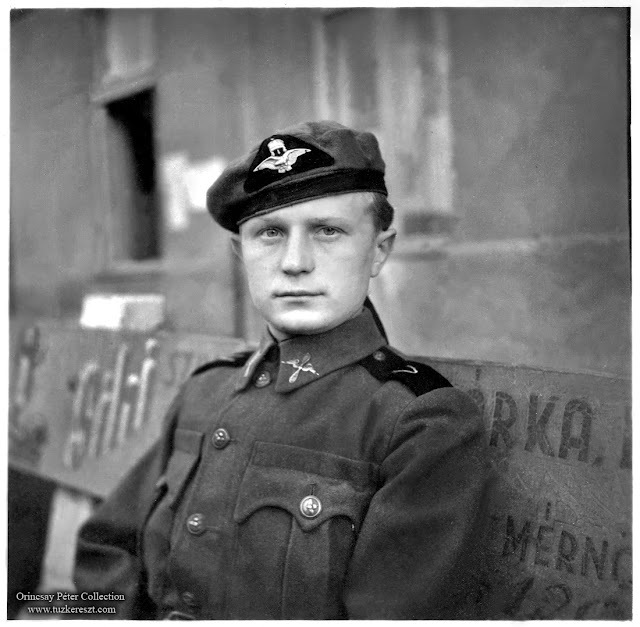 Hungarian sergeant with a proud expression for the perfect studio photograph. 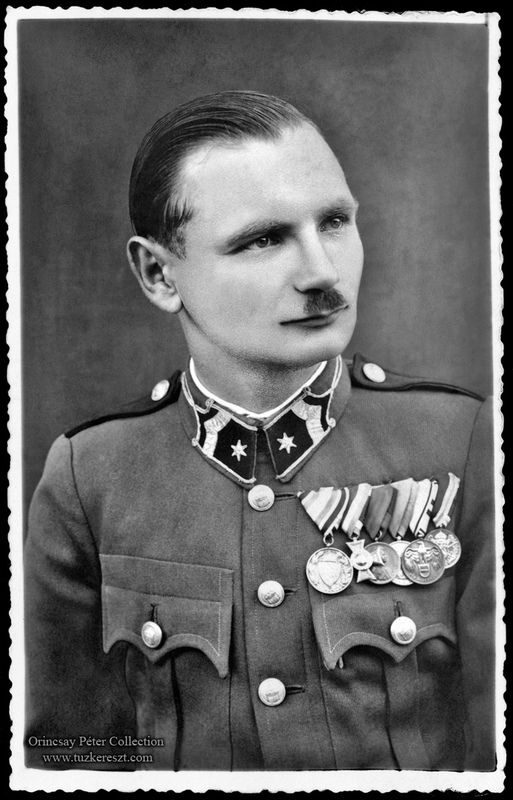 Regular sergeants uniform of the later type (past 1936) with folded collar and silver bullions, buttons and metal star. Some images from the Hungarian Air-Defence training in 1942/43. 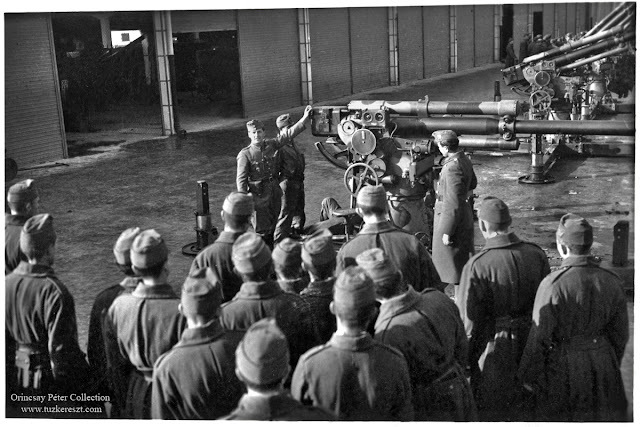 Photographs from Sándor Molnár, Air-Defence Warrant Officer's photo-heritage.
" While the train pauses.."
Some moments are not always special, and one does not realize any special importance to capture it, or make it last. 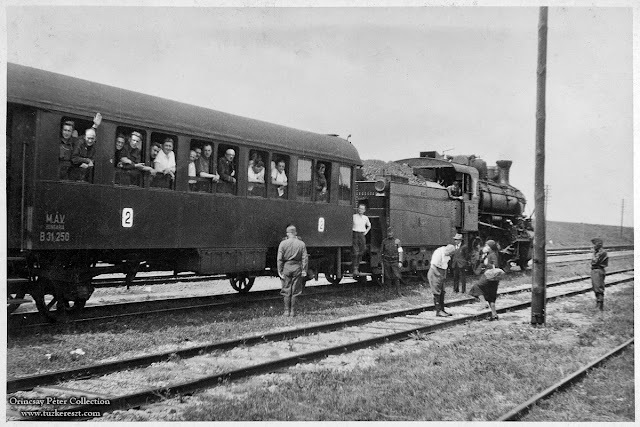 Just like when the trains stops on the tracks and pauses for a while. 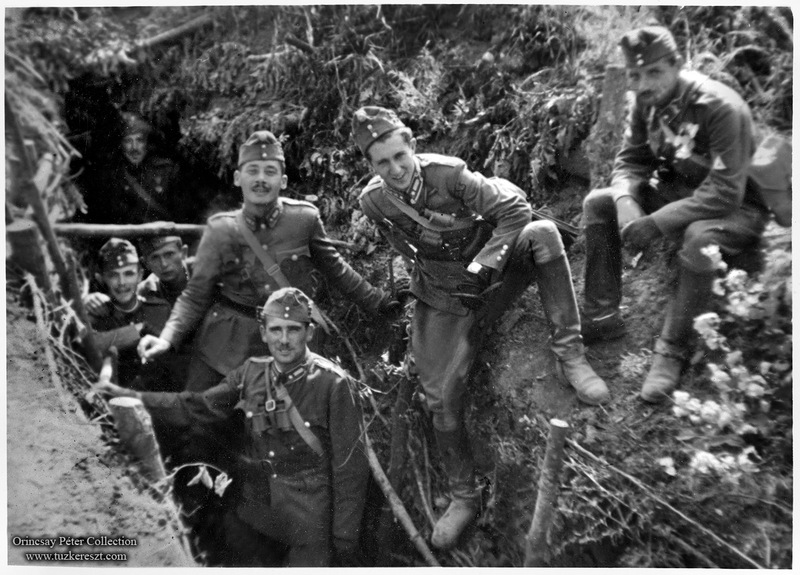 One soldier though, grabbed his camera and took the opportunity to make some photos. 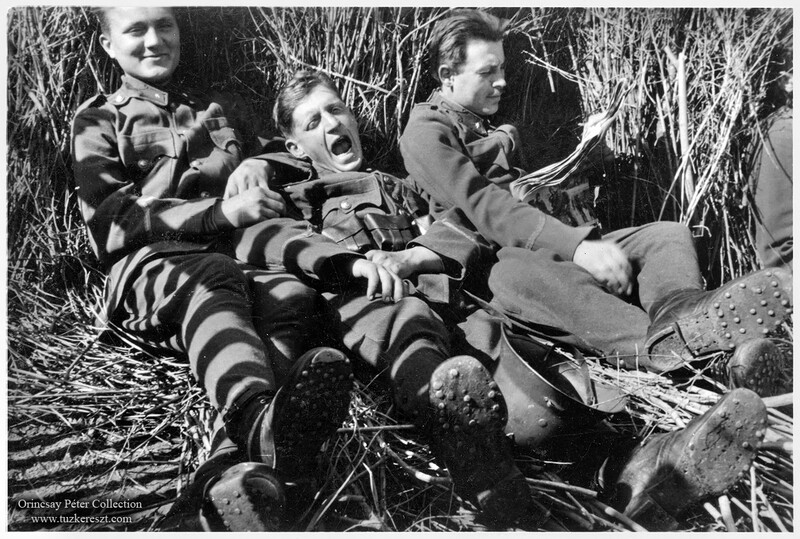 I like these special moments of "non-importance" because this is what military and ordinary life contains, and it gives a special touch of regularity amongst more important moments in history. Group photograph in a boat with the guitar player in focus. Hungarian Honvéd Private in the high-collar 1930th type uniform. Hungarian infantry corporal dressed in the light summer tunic. Hungarian war-time Red Cross stamp.
" 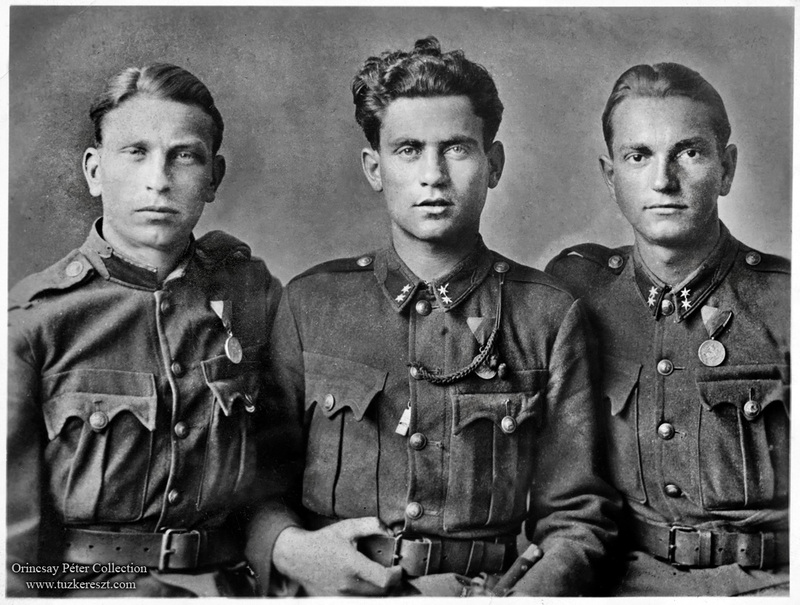 Three Good Friends "
A Hungarian private (Honvéd) and two corporals, all three nicely decorated with the 1941- Return of Southern Hungary (Délvidék) remembrance medals. The corporal in the middle is also decorated with the green infantry marksman lanyard.
" 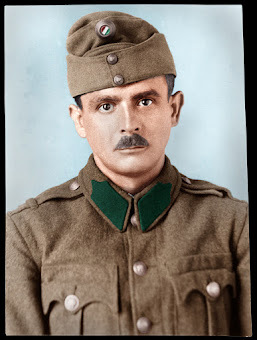 Colours from the past "
Hungarian artillery sergeant pose with his loved one. 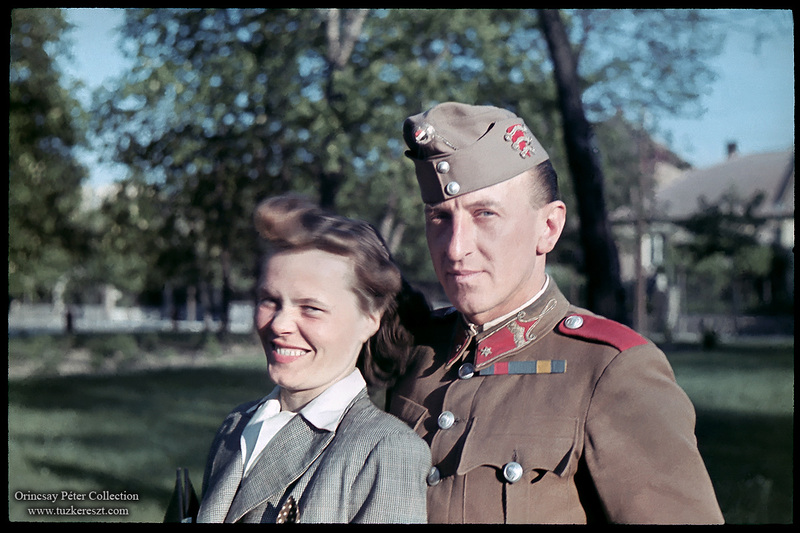 The photograph is an original colour slide most likely form sometime after 1941/42. 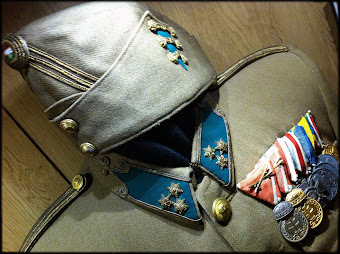 The three ribbon bars that the artillery sergeant wears, are the most common combination in this time. 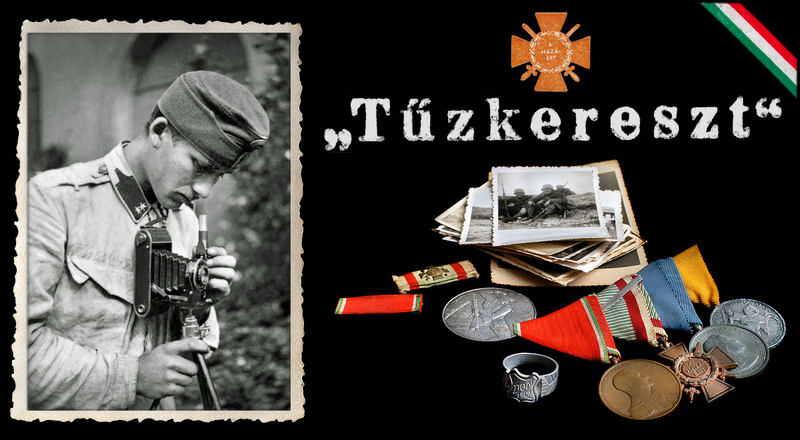 From left; the 1938- Return of the northern territories (Felvidék) remembrance medal, the 1940- Return of Transylvania (Erdély) remembrance medal and the 1941- Return of Southern Hungary (Délvidék) remembrance medal.
" 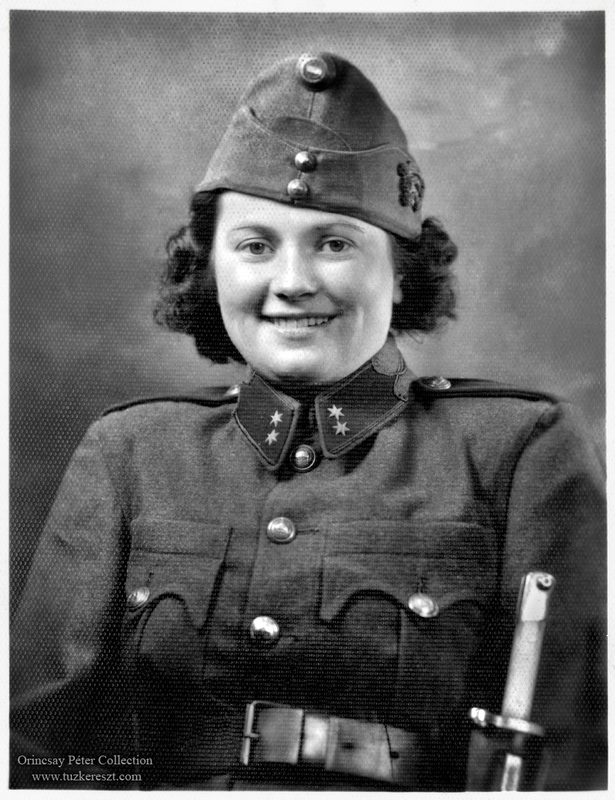 Sweetheart in Uniform "
A Hungarian corporal's sweetheart, dressed up in full uniform for a nice studio photograph.
" 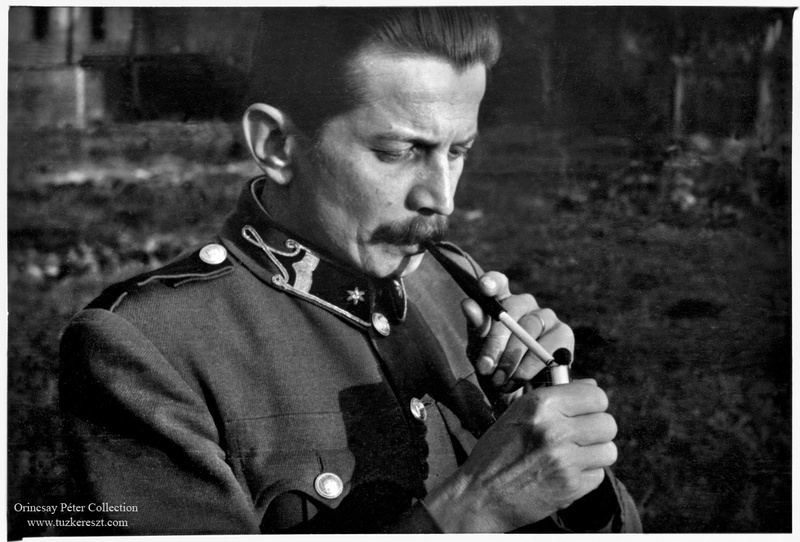 Time for a smoke "
Hungarian sergeant lights up his cigarette, from an unknown photo-series of the 1940 Transylvanian campaign. 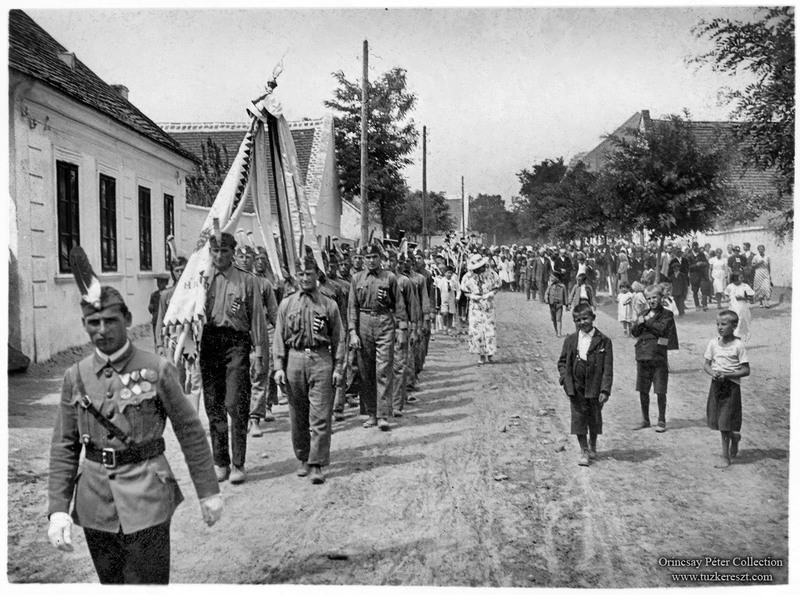 Levente Youth on parade through some unknown Hungarian town. 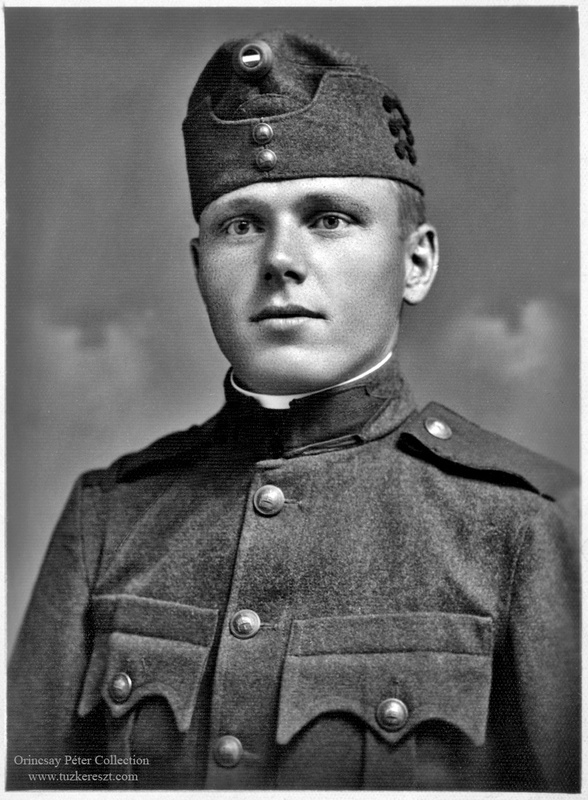 The national patch on the Levente Youth uniforms indicates that it's some early (1920-30) version, as well as the feather in the Levente cap. 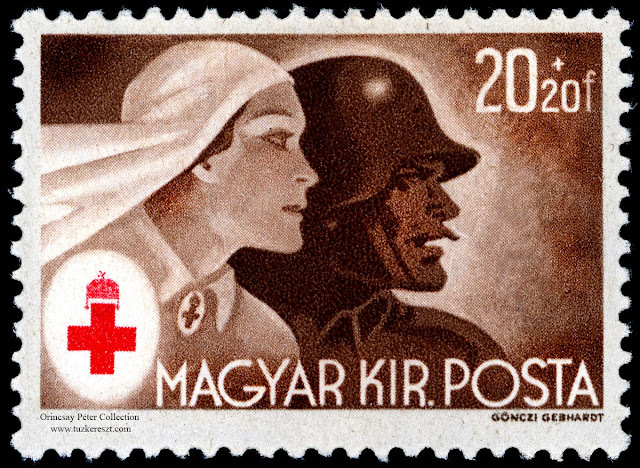 Hungarian war-time Red Cross stamps. A familiar view for every man who ever served in any army, any time. The everyday chores fills most of the days until the the service is done. 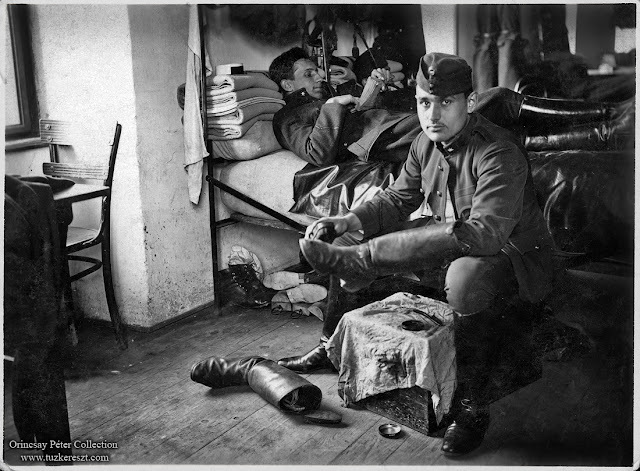 It's not always the battles or the triumph of heroism that's the most lasting, but the everyday life and the comrades made for a lifetime, that are the most common connection for soldiers. 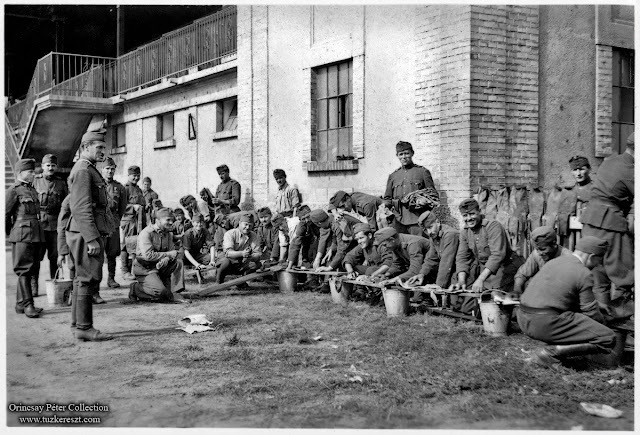 Here's a great glimpse of the everyday life at the barracks, taken by someone who knew this life and wanted to preserve a very telling moment. 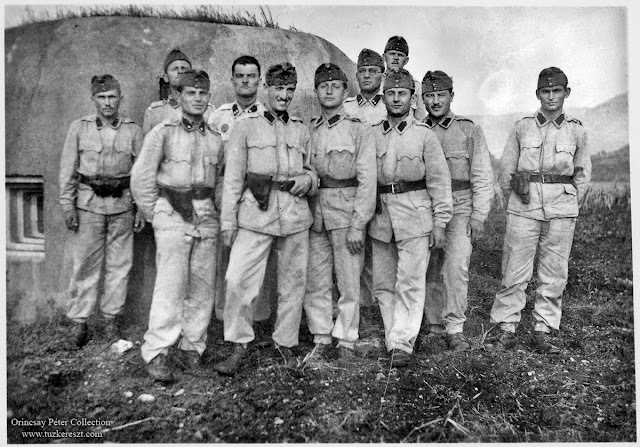 Hungarian soldiers pose for a group photograph in front of a pill-box. 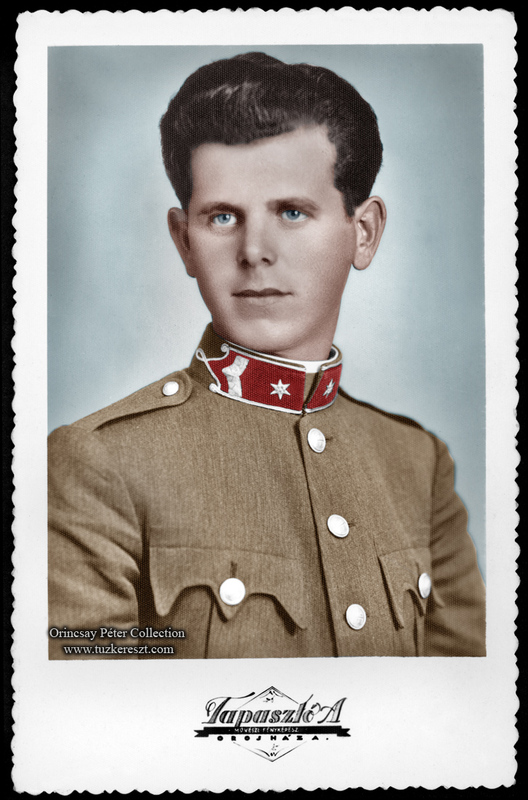 Dressed in the light summer cotton uniform instead of the light brown regular uniform.
" 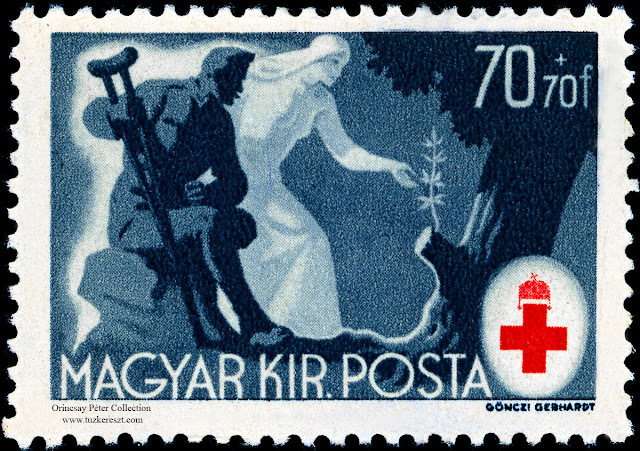 Lengyel-magyar két jó barát / Együtt harcol s issza borát "
" Polak, Węgier, dwa bratanki / I do szabli, i do szklanki "
"The Hungarian and the Pole are two good friends, Share their fight and their wine together", is an old saying used to describe the ancient thigh between the two European countries. Good relations between Poland and Hungary date back to the Middle Ages with the Piast and Árpád dynasties often intermarried with each other; renowned Hungarian King Saint Ladislaus was half Polish. 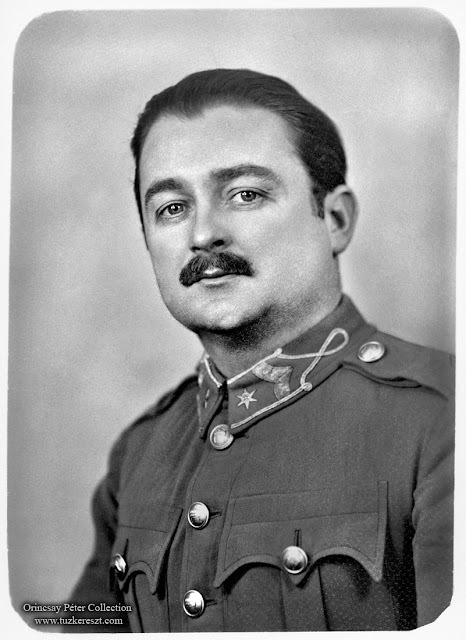 In the Hungarian Revolution of 1848, the Polish general, Józef Bem, became a national hero of both Hungary and Poland, is just one of many example with common historical conflicts. 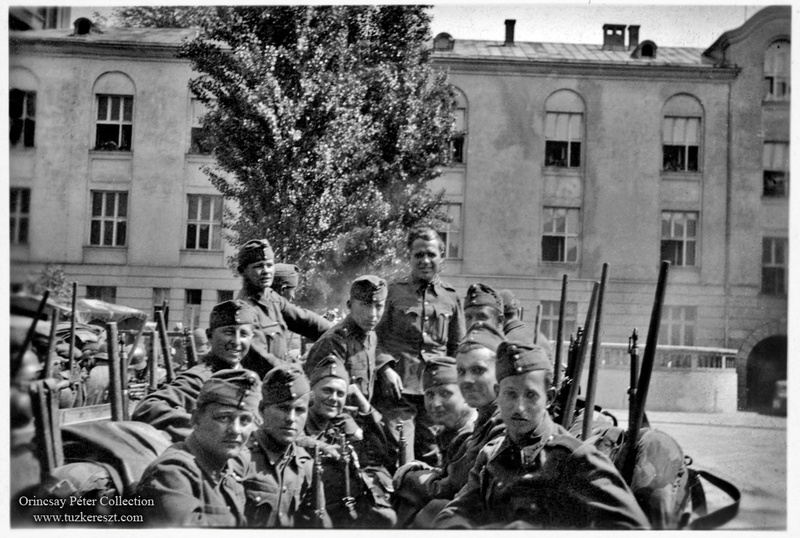 During modern times, the outbreak of WW2 became such and example where the historical friendship between Hungary and Poland once again emerged. As Germany and the Soviet-union conquered Poland and split the country between them, Hungary opened its borders on 17. 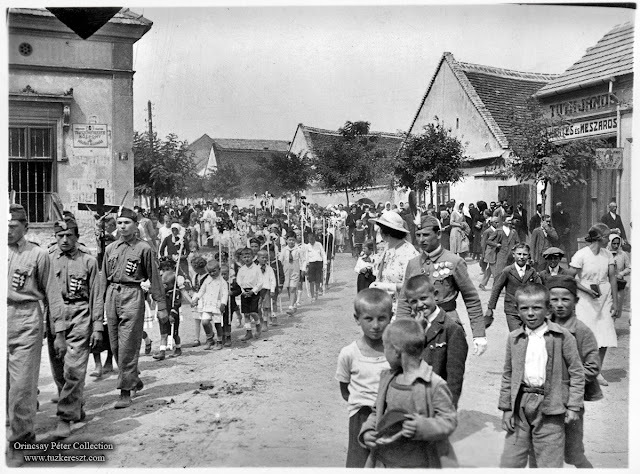 September 1939 for the remains of the polish army and civilians to seek refuge. 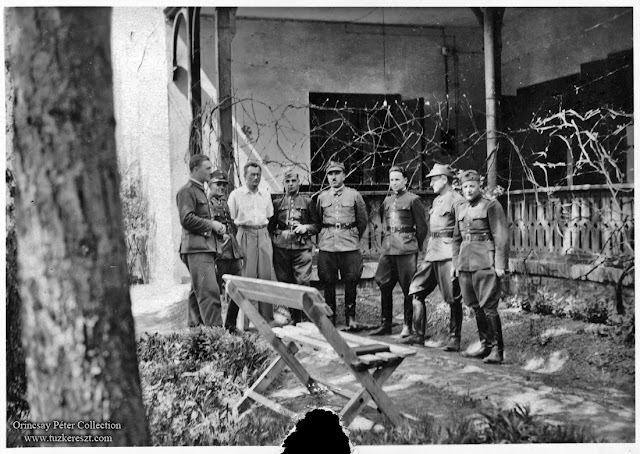 The well over 100.000 Polish soldiers and civilians who took their refuge in Hungary, where welcomed by the Hungarian society. 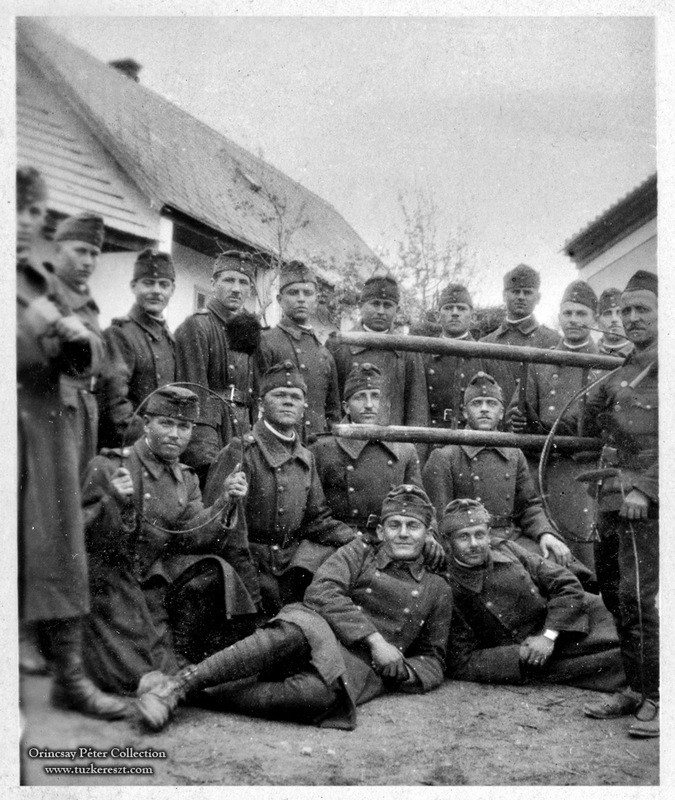 The soldiers could wear their uniforms and even received the equivalent of their polish pay from the Hungarian army. 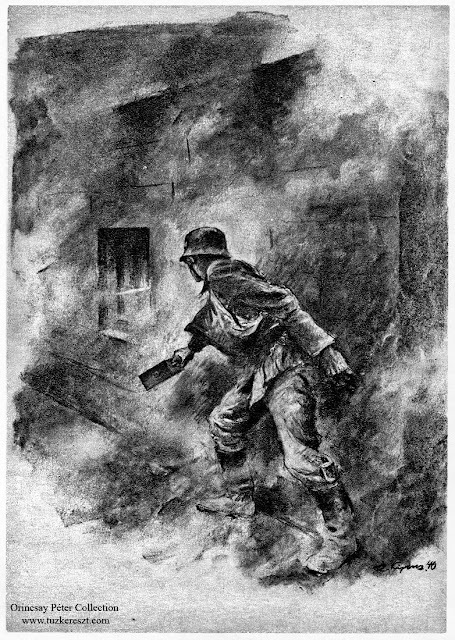 Hungary refused every German demand to extradite the polish military personnel and allowed the Polish government and over 70 thousand military personnel to escape into neighbouring Romania, and from there to France and French-mandated Syria to carry on operations as the third-strongest Allied belligerent after Britain and France. These three small 6x9 photographs, taken in the spring of 1940 came to me among many other mixed Hungarian military photographs resently. 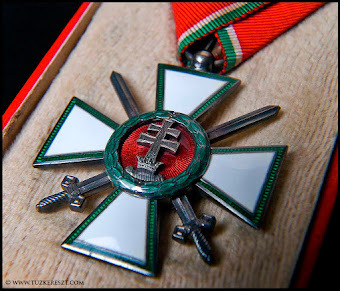 Clearly belonging together, they are a nice documentation of a lesser known part of history, and a part of the national friendship between Hungary and Poland. 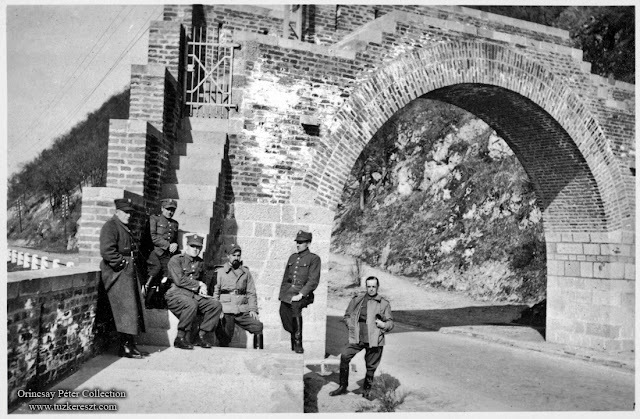 The place where the photographs are taken is just outside of the community of Visegrád, north of Budapest along the Danube river. 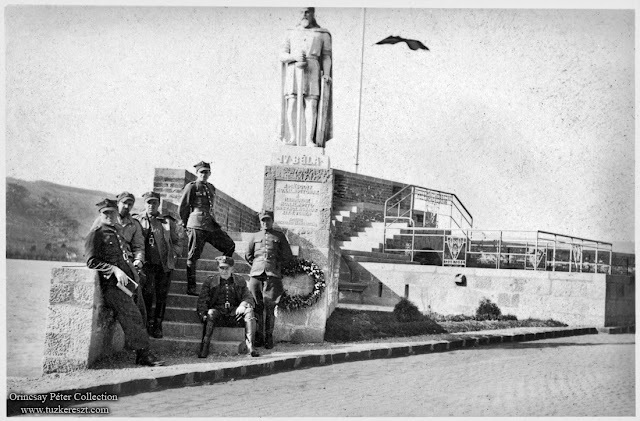 The statue of the Hungarian King Béla IV and the memorial of the lost Hungarian territories in 1920, where built in 1938. 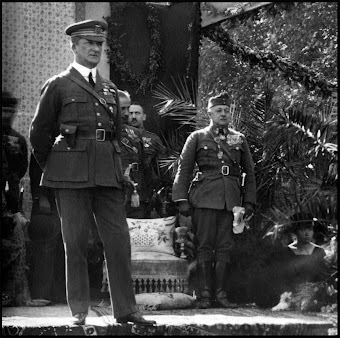 It stands there even today and looks more or less the same.